Separating the two mobile giants is the OnePlus5 that seats on the second position and that’s laudable since the smartphone is only just a new tech startup in the mobile industry. I am pretty sure another leader may emerge during the week but until then let’s keep our fingers crossed. 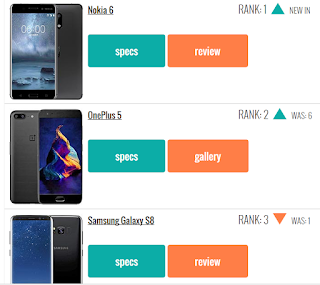 According to the leaderboard on GSMARENA, Last week's silver medalist, the Xiaomi Redmi 4 has slipped down to 4th this week, ahead of the Samsung Galaxy J7 Prime and the Redmi 4. The apple iPhone6 still lags behind the Redmi 4a which currently seats 4th on the chart all thanks to the reduction in price that made way for more popularity. The Samsung Galaxy A5 (2017) and Galaxy J7 (2017) stole the final two spots on the ten man list. Both devices had also shrugged off the premium Galaxy S8+ off the chart.